Students participating in the I-69 Collegiate Innovation Challenge Grace College students from left to right are Emily Guinter, Annette Hammond, Dominic Kimrough, Matt McNeal, and Abbey Hartwinger with Prof. Al Grossnickle. 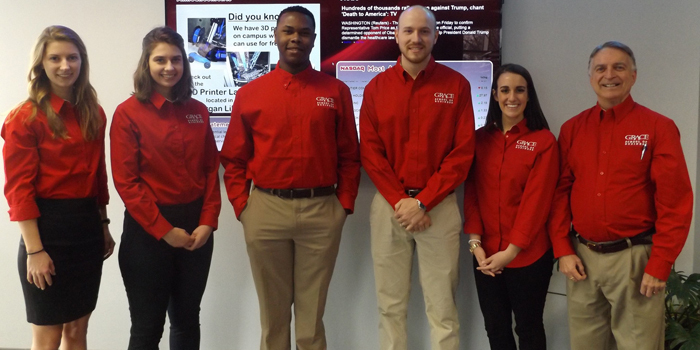 WINONA LAKE — Five Grace College business students participated in the tenth annual I-69 Collegiate Innovation Challenge Feb. 10 and 11. The event, hosted by the Grant County Economic Growth Council, took place at the Swan Lake Resort in Plymouth. Students from Huntington University, Ivy Tech Community College, Taylor University and Indiana Wesleyan University also participated. The I-69 Collegiate Innovation Challenge brings together university students from along the I-69 corridor for a weekend of innovation, problem solving and entrepreneurship. Five teams competed in the challenge; each team was comprised of a student representative from each participating university. The students were placed into teams Friday afternoon and collaborated for less than 24-hours on a for-profit business solution to the social problem that was selected by the students. The 2017 social problem that the students choose was prison overcrowding. The 2017 winning team included Emily Guinter, Grace College; Kyle Barry, Indiana Wesleyan University; Emma Reese, Huntington University; Jackson Wilcox, Taylor University; and Carson Adams, Ivy Tech Community College. Each student was awarded $500 in gift cards for their business concept, “Design Again,” a business solution that utilizes the creativity of former inmates to produce and market products for small businesses. The second place team included Matthew McNeal from Grace College. Each member of the second place team won $250 in gift cards for creating “KP Trucking,” a freight moving company that hires, trains and mentors prisoners after their sentences are served. Members of the third place team, including Annette Hammond from Grace, won $100 for creating “Life Loan,” a career-placement and lending organization.